To Cork or Not to Cork: Tradition, Romance, Science and the Battle for the Wine Bottle by George M. Taber. Simon & Schuster, 2007. Former Time writer and editor George Taber was the only reporter present at the famous 1976 Paris wine tasting where California wines showed that they could compete with the great wines of France. He wrote about this event and its implications is his wonderful 2005 book The Judgment of Paris, which was named best wine book of the year by Decanter magazine. There are all sorts of ways to keep wine in and air out of a container: natural corks, composite cork stoppers, screw caps with tin liners, screw caps with plastic liners, plastic corks of many types, elegant glass stoppers and practical soda pop crown caps. And this is only for wine in glass bottles: you can also package wine in aluminum cans, juice boxes, plastic soda bottles and bag-in-box “casks.” Sealing the 20 billion bottles of wine that will be produced this year is a $4 billion business. I learned a lot from this book. There is no best way to seal wine, there are only better ways under different circumstances with different trade-offs. Natural cork-sealed wines age and develop in the bottle, can be “corked” or suffer from TCA contamination. Plastic corks usually won’t contaminate the wine, but they don’t always seal tightly over time, so the wine can be oxidized after a couple of years. 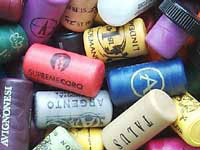 Screw caps are TCA-free, but they, can seal too tightly, with the result that the wine can suffer sulfur reduction, which gives it a rubbery or rotten egg smell, and screw cap wine can fail to develop as it ages. No matter what stopper winemakers use, they can never be sure that the wine they put in will be the wine that you pour out. You might think that global wine market competition would have produced a “best practice” solution for wine closures, but the market is too complicated and diverse for that. The science may be universal, but the people (both producers and consumers the the middlemen in between) have their own quirks. In France, for example, it is hard to sell a screw top wine, at least for now, because of the strong attachment to tradition. I can appreciate this. I have friends who get great pleasure from the ritual use of elaborate corkscrews. Screwcaps leave them cold. In Great Britain, on the other hand, it is apparently getting somewhat harder to find a natural cork in a popularly-priced wine because the supermarket buyers, who wield such market power, are strongly biased in favor of plastic and screw top closures. Like many in the business, they have been burned too many times by problems they associate with bad corks. Here in the United States there is some evidence of the market bifurcating, with plastic and screw tops for wines bought for early consumption (under $20) and high quality corks for expensive and age-worthy bottles. I think Taber is right but for now I’m just standing here in the basement, looking with suspicion at the wine in my little cellar, trying to guess what is going on beneath the lids. Having read Taber’s book, I now know enough to be anxious about each and every bottle! Interesting thoughts. I would revisit this topic again as it is undergoing both rapid change and rapid advances (from all closure producers). Since you are interested in the closure debate, I’d really love to get your impressions about some figures that have emerged on the Quebec market, and the inferences I’m making about corked wines. See my blog post here.